Is your wife's birthday is just around the corner? When was the last time that you gave your mother a gift? Don't fret about looking for the right gift cause Tefal has something wonderful for all. Tefal, the world’s leading cookware and small home appliances maker, introduces the ‘Tefal DeliRice RK8061’ induction rice cooker that offers greater flexibility to cook your favourite dishes. This multifunctional machine is the first induction rice cooker to be launched in Malaysia. Its advanced heating technology not only saves cooking time, but it is also energy efficient. Consumers are now able to cook perfectly fluffy rice and eat healthily at home without spending too much preparation time. 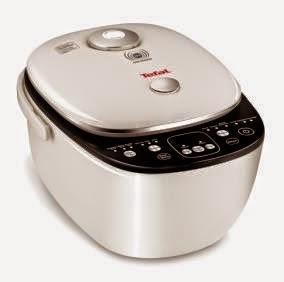 Compared to traditional heating rice cookers, the induction heating rice cooker uses the entire inner pot as a heating element, thus making it quicker to heat the pot. The advanced induction heating technology encompasses an electric current from the external vessel that creates a magnetic field surrounding the pot, thereby generating an efficient heating convection. Instead of depending on heat from the heating plate at the bottom of the external vessel found in most conventional rice cookers, the Tefal DeliRice RK8061 provides an even temperature flow throughout all cooking levels thanks to the 3D induction heating. The Tefal DeliRice RK8061 induction rice cooker is also fast and responsive to temperature change due to the accurate temperature sensing modes. Consumers are able to make instantaneous and precise adjustments to allow the rice to cook more evenly and with better taste. The Tefal DeliRice RK8061 induction rice cooker features 12 cooking programs that can be used with 15 possible combined functions. The multiple rice type selection give rice lovers a choice between selecting three types of rice: White, Brown and Japanese rice; whereas the multiple rice texture selection allows users to choose the preference for soft, normal or hard textures. The ten extra functions range from congee, porridge, soup, quick cooking, small quantity cooking, steam, reheat, keep warm function, adjustable timer and pre-set function. The Tefal DeliRice RK8061 induction rice cooker consists of a durable non-stick pot made out of high-quality stainless steel and conductive alloy. The 2.0mm thick stainless steel inner bowl rapidly transmits high heat generated by powerful induction heating and uniform temperatures throughout the cooking processes. Tefal DeliRice RK8061 comes with an LED control panel and micro-pressure valve that yields better cooking results. The automatic keep warm function goes up to 12 hours, while the pre-set function can be set until 24 hours. 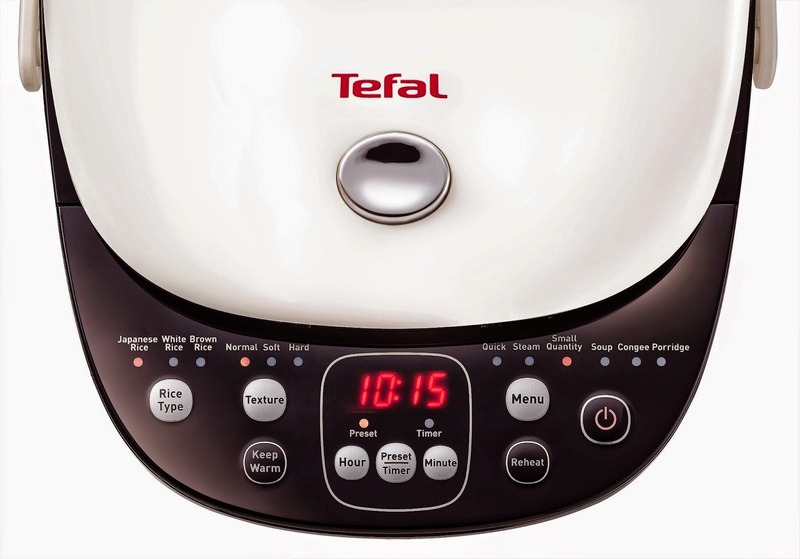 The Tefal DeliRice RK8061 comes with multiple accessories such as a steam basket, measuring cup, rice and soup spoons. It is easy to open with 1-click and has a handle which makes it easier to bring around. The upper lid is detachable, while the steam shield and inner pot is removable for easy cleaning. The Tefal DeliRice RK8061 is designed exclusively with a white and black square shape suitable for the simple modern kitchen. The Tefal DeliRice RK8061 induction rice cooker will be available in main department stores and electrical specialists at the retail price of RM479. For more information on Tefal’s products, please visit www.tefal.com or contact customer service: +603-7802 3000.